News just in this morning from Hanneke Maljaars at Oceanstyle that Jamie Small in the Palma office has reported a whopping €600,000 price cut by a keen seller for the 24m Leopard motor yacht Maxou. Built by the Arno yard in 2006 and delivered in 2007, this superyacht has a spacious lower deck saloon and accommodates six to seven guests in three staterooms including a large master cabin forward. 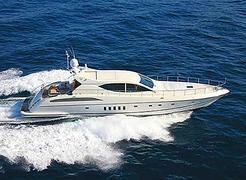 Her twin 1500hp MTU engines drive two KaMeWa waterjets at speeds of up to 35 knots and have been used for only 350 hours. Maxou is now asking €2 million.